The iBoardTouch is an LED touch screen with a built in PC module. This all-in-one solution removes the need for a projector and maintenance. The software supplied enables 6 point multi touch, allowing students and collegues to work collaboratively on the screen. The new models also feature an anti-glare toughened screen. Due to its design the board is significantly more energy efficient than a standard projector and board setup, therefore decreasing energy consumption. As the board operates on Windows 10 any programme that can be used on a PC can be used on the iBoardTouch, making any transition from alternative equipment that much easier. Training on the board can also be provided. If you are interested in a demonstration session please let us know, we can often leave a demo unit with you for a few days for staff and other potential users to try at their leisure. 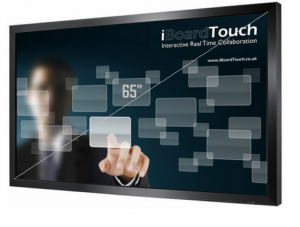 Please call or email for details on the iBoardTouch as the technical specification and the flexibility of this product is truly breath taking.